Morgan Says: As Therese mentioned in last month's post, I've been pretty darn busy with promotions, lately. 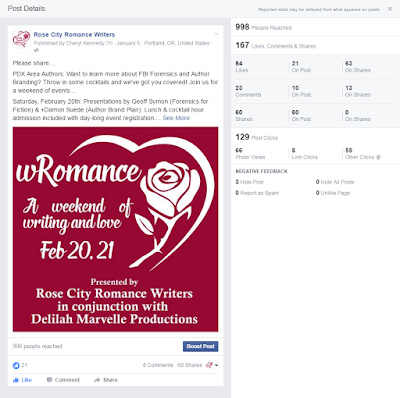 I am officially the VP of Communications for Rose City Romance Writers (RCRW), the Portland chapter of Romance Writers of America. I take this role very seriously. As you all should know by now, I LOVE marketing and at it's most basic level marketing is communications and communications is promotions. 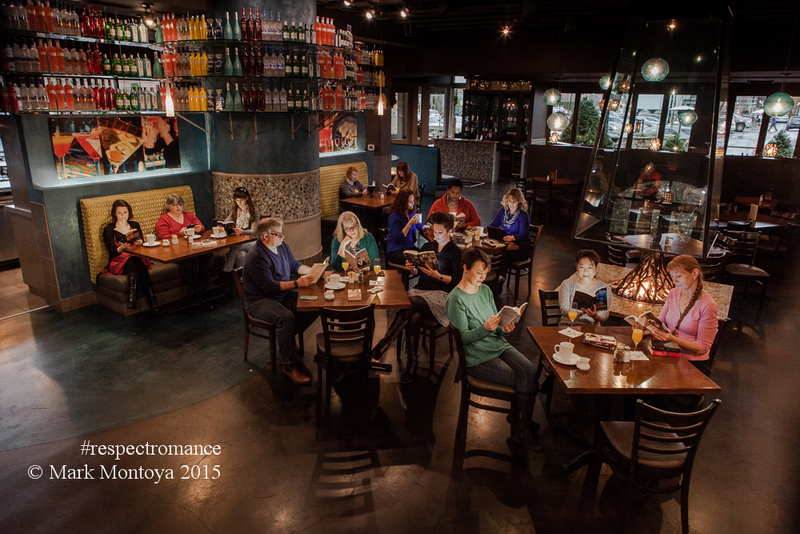 In February 2016, RCRW conducted an event named wRomance: a weekend of writing and love. 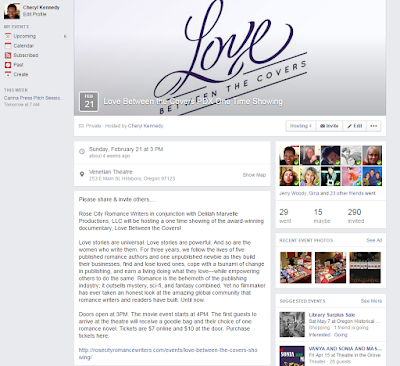 wRomance included two half-day learning sessions Saturday, a cocktail hour reader event Saturday evening, and a Sunday afternoon showing on the documentary 'Love Between the Covers.' Sounds simple, right? It took place in February: which meant that early promotion of the event ran into fall holiday communications. It was hard to get attention for the event in the midst of our audience's holiday preparations. Plus, if we waited too late, then our messaging would be lost among the Valentine's Day promotions. We decided to branch outside of our usual circles to reach a broader audience: We reached out to the local arts community. Under the #RespectRomance, we hit social media with content. Our VP of Programs, Anne Tenino, scored an editorial article with Huffington Post. And I produced sponsored content for Portland Monthly's 'On the Town' blog. In the end, we now have a database of more than sixty local cultural organizations, libraries, booksellers, and media outlets for future communications, but it was HARD work to build that list. Start planning your promotions EARLY - this event was in February 2016, but we started planning it in late September 2015. The team at 'Love Between the Covers' made my promo life super easy by having a superb media and promotional kit chock full of high resolution images, author quotes, a press releases template, and sample email template. They even sent us post cards with room for personalized event stickers and movie posters for the venue theater. With help from my VP of Programs, we created similar promotional materials (fliers) for the writing day and combined event. Along the way, we realized that we needed some professional photography work for the articles. Planning so far ahead gave us plenty of time to plan a photo shoot. The pictures produced are now the headers for our RCRW's Facebook and Twitter pages. Starting early also allowed us to plan and tweak event specific webpages for the RCRW website. Quote Block provided by the 'Love Between the Covers' media kit. PICTURES garner more clicks than just words on social media - Speaking of pictures, combining pictures with a link garnered wwwaaaaayyyyy more clicks, likes, shares, and reTweets than text alone. I did my own version of A/B testing by posting the same text with and without a picture on both Twitter & Facebook. On both social media outlets, the post with the pictures had more interactions and thus helped us to more easily spread the word about our events. 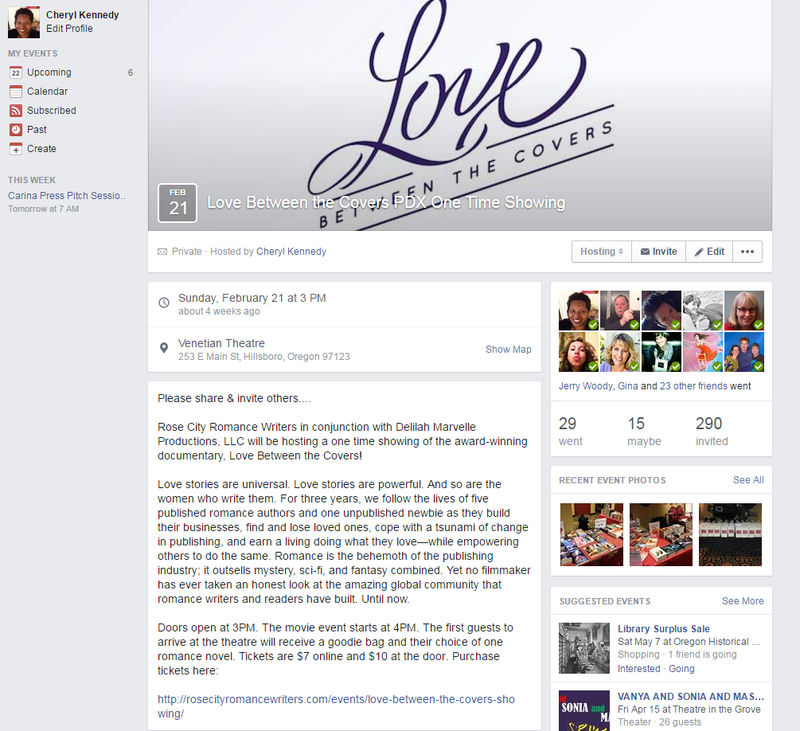 Facebook Post Stats: this post reached 998 people...not too shabby for a local event! The MAGIC of 'Please Share' - Notice in the picture above the post starts with 'Please Share.' And guess what - people shared!! The posts that included those two simple words were shared far more than the ones that didn't explicitly ask to be reTweeted or shared. 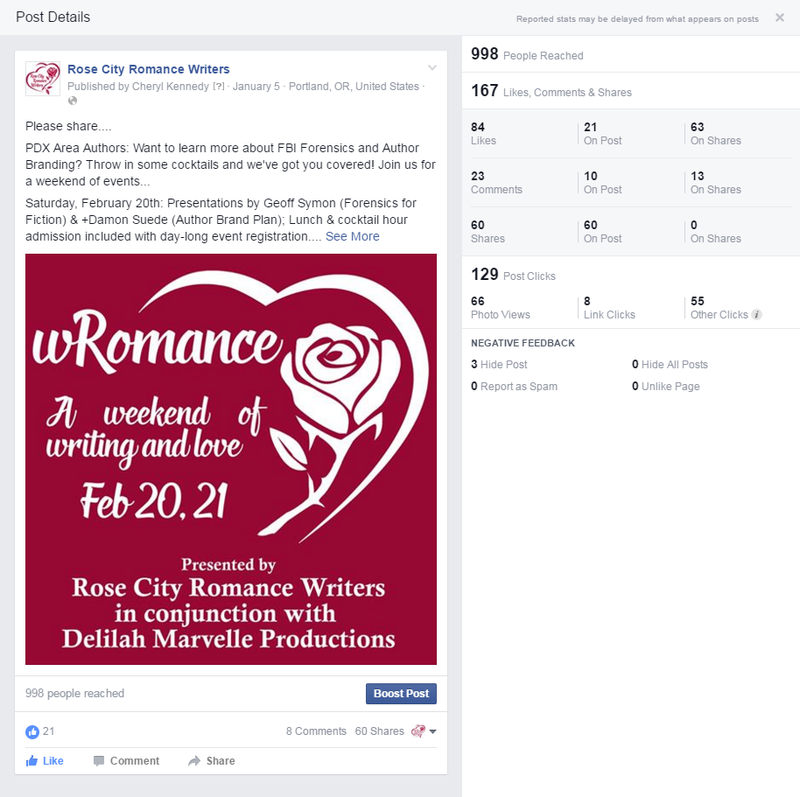 If your audience is on Facebook, creating a FACEBOOK EVENT will work wonders - I created a Facebook Event on both the RCRW Facebook page and my personal Facebook page. Through the event, I invited local friends to the movie showing. As you can see in the image below, by allowing friends to share this event, 290 people were invited. Notice that only 29 people responded...this is normal if not high - a 10% response rate is great. Trust me when I say that more than 29 people came to the event. Many were on this invite and simply didn't respond. Again, normal behavior - which just goes to show you that you can't always trust RSVP counts! Facebook Event Stats from my personal page invite. Don't be afraid to ASK FOR HELP! - Prior to this event, I'd never worked with Press Releases. My buddy, Anne Tenino - VP of Programs, had worked with press releases in her past life as an event coordinator. It was great to have her take the lead on this part of the project and I learned a ton from her along the way! Don't be afraid to ask your friends, family, and readers to help you with event promotions. In fact, getting help is a GREAT way to help spread the word about your event and build buzz. I was incredibly happy to be part of an event committee for this project. We worked as a team on all aspects of this event. The team allowed me to focus on promotions while others worked on the venue, website, and day-of coordination. Was the event a success? We increased visibility for our local chapter, RWA, and the romance industry via our community outreach activities and online media articles / placements - which lead to new members. We solidified relationships with our favorite local bookseller and review site owner - which lead to increased good will with both parties. We had FUN! 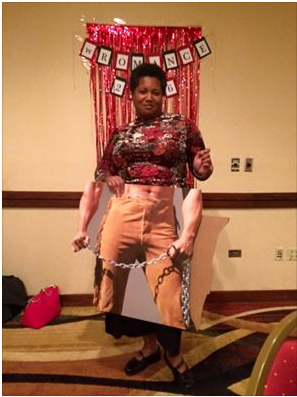 Let's just say that when you mix romance authors with readers, a well stocked no-host bar, and a life-sized cardboard cutout of Fabio, all manner of shenanigans ensue! - which strengthened the friendships among chapter members and all the new friends that we made along the way. Me folding up Fabio for safe storage. Know you audience and start planning early for your events to be successful. Check our Books Page for more POP options! We are available for workshops.